Who knew it would cause such a fuss! You guys flipped over it! A friend sent me this picture (I did not make this or take the photo), and I thought it was too crazy not to be shared. Amazing the strong reactions on both sides that this over-the-top dessert stirred up! This, my friends, is PIECAKEN. The sugary version of turducken. Pie baked into a cake. Amazing to some. Horrifying to others. 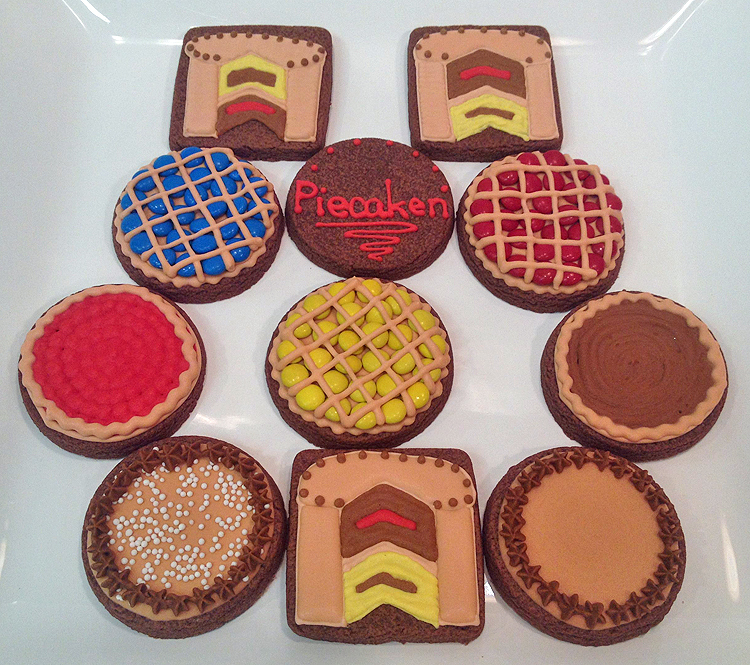 But regardless of your position of it, piecaken did create quite the stir. I received 7 emails from people wanting me to make this for them. One request in particular really got my attention. It was from a soldier in Afghanistan asking if I could make one and send it to him and his troop because the food they eat there is far from yummy. After much research, I learned that this would not make the trip. But how do I ignore such a request from the soldiers who were dedicating their lives to protecting my freedom to make such a dessert? And on Memorial Day, nonetheless. So what’s a baker to do? Make them in cookie form, of course! Along with more pie and cake! So while I was bummed that I couldn’t ship them an actual piecaken, I hope Jerry and the 66 soldiers in his troop enjoy a more shippable version. Oh, and I will so be making my own version of the real thing. But my girls have decided I need to use a chocolate pie, and maybe an oreo cookie pie instead. No fruit in our sugar coma fest! Want to make one, too? Here is the recipe (posted by For The Love Of Food). I didn’t create it. I’m not exactly certain who did. If you know for certain, post a comment so I can give proper credit, because this genius deserves the recognition due! This is the “quick” version. You can make any or all of this from scratch. Take one box cake and make the batter according to instructions. Pour half the batter in a 9” round cake pan. On top of that, put the first pie. Pour the rest of the cake batter on top of that and bake it according to the box instructions. Take the next box cake mix and make the batter according to instructions on the back of the box. Pour half the batter in a 9” cake pan. On top of that, put your second pie. Pour the rest of the cake batter on top of that and bake it according to the box instructions. Once both cakes are done, wait until they cool and then assemble and decorate cake as normal. 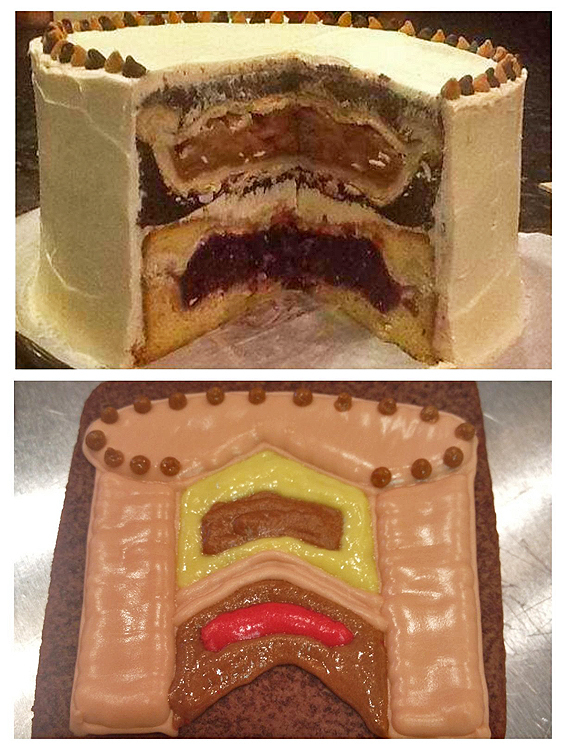 Whether you find piecaken incredible or disturbing, I hope your week is sweet! I’m very intrigued by this dessert! I think it would be better if the flavors were more complimentary. We’ll see! So glad I got to do this with you!!! Your cookies turned out awesome! Girl, you are the best! 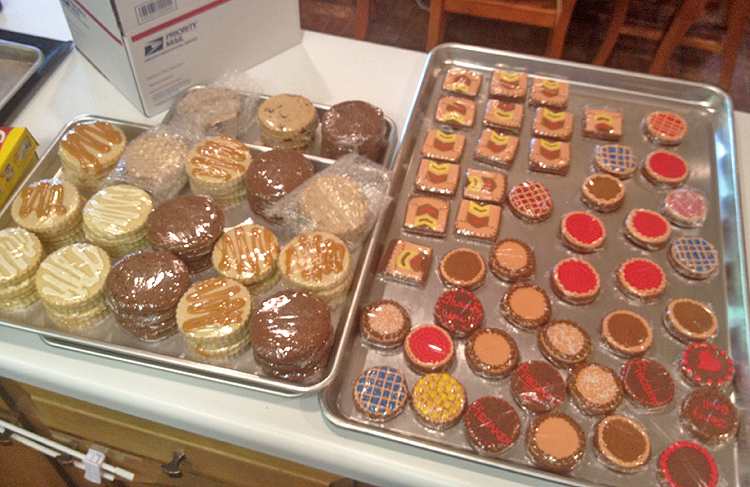 how great of you to make the cookies for the troops! i’m sure they’ll enjoy them very much! This is very disturbing. Looking at it makes me have an unpleasant lump in my throat. I’d like to hear about who ate it and how did they like it? This dessert has definitely brought on many mixed emotions, that’s for sure! I’ve never eaten one before. I think it would depend on the combination of flavors for me. Not sure this one would do it for me. You should look up… cherpumple. Three layers! I see a google search in my near future. I made a PieCaken this past weekend for the Thanksgiving Holiday. I would LOVE to share my pics, recipes and instructions. I chose a deep dish homemade apple pie and baked it in a Traditional Spice cake and served warm with Spiced rum whipped cream and drizzled with warm rum butter syrup! Please share it on my Facebook page. I would LOVE to see it! Wow!! I would LOVE to have your recipe for ALL that u mentioned in this post plz! been looking for new deserts for the holidays…..
And we thank you so much for those cookies the guys and I loved them so much. I was telling my mom about it all, and was telling her tha tI want to order on of those piecaken for the holidays here, now that we are back. I am SO glad you got them!! I was worried they wouldn’t get there before you left. Email me (tara@theshakybaker.com) with what area you are in. I’ll bet I can find a local baker that would love to make one for you. And if not, I’ll find a way to get one to you. I’ve never shipped a cake before! Thank you again so much for all you do! LOL!!! i think its awesome!!! i am gonna try it!!! Be sure to post a link so I can see it! I know. I’ve always missed the “en”. 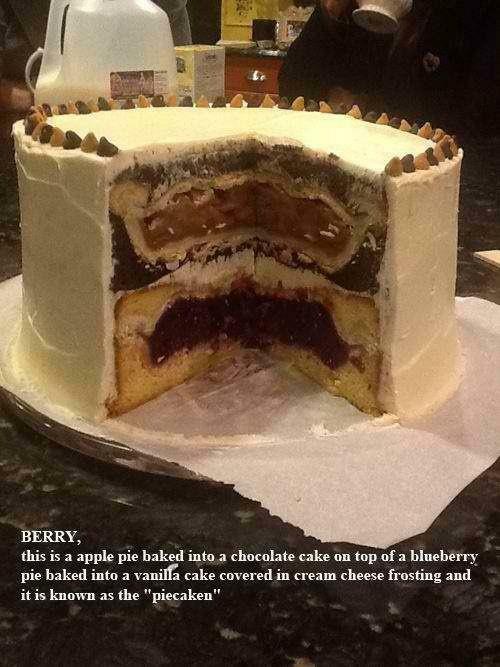 Pingback: Imagery Unlimited » OK you have heard of a Turducken, how about a Piecaken? or arctic explorer, there exists going to be considered a G-Shock watch to accommodate you. 1990s. The power in the sun, as well as fluorescent lights, is collected in solar panels built into the timepiece face.